CORRECTION: the original story stated that students reported the student was at school with a gun. This was not correct. There was no report of a gun. 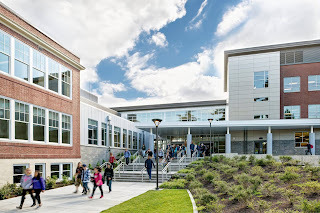 The 14 year old freshman boy who precipitated the situation which led to the lockdown at Shorewood High School on Thursday, was located and booked into the Youth Service Center the date of the incident for investigation of harassment. He posted a photo of himself with a weapon on the social media photo sharing site Snapchat on Wednesday night. Thursday, two students reported that they believed they saw the individual suspected of making online threats on campus but did not claim to see a gun or weapon of any kind. This prompted the lockdown and police investigation. It was quickly determined that the Thursday morning reports were not credible and there was no immediate threat, but students were sent home while police and school officials did a thorough investigation. Curriculum night was postponed. Students who traveled to school by bus or car were quickly dismissed, but per school protocol, students who walk to school had to be released to a parent or designated guardian. This created a major traffic jam around the school and neighborhood. According to a police spokesperson, the student was probably not detained at the Youth Service Center. According to other reports, there were no weapons at his house and his father was cooperating with police and school authorities. Because Shorewood is a very new school, it was designed to current safety standards. The principal is able to lock all the doors in the building with the push of one button. The previous building had outside doors for almost every classroom which had to be manually locked by someone going around to all the doors with a key - a process that took a half hour at top speed.